Having a good home wireless network is crucial to support the quantity and diverse range of devices which rely on it. The single-unit wireless routers provided by the Internet Service Providers (ISPs) are insufficient to support the wireless demands throughout the modern home. Wireless technology means that every wireless access point only has a limited range, so a single-unit WiFi solution is only suitable for a small house or flat. Multiple access points are therefore needed to provide good coverage throughout the home. 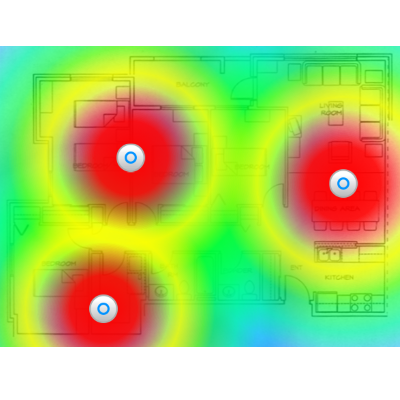 These images show the strength of 5Ghz WiFi coverage throughout a home and compare a ‘single-access point’ to a multi-access point’ solution. With the single-unit many areas of the home get poor coverage (grey/violet/dark blue), so will either stuggle to connect or connect, but be very slow. 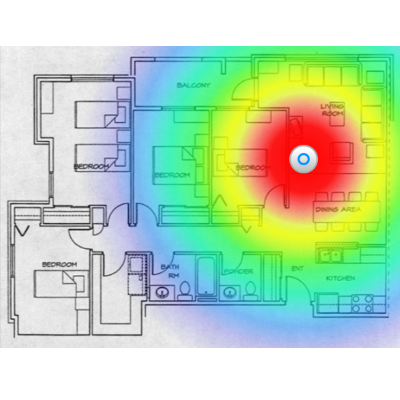 The multi-access point’ solution provides good coverage to the whole house (red/orange colours). This solution will provide a much better wireless experience for the user and be able to handle multiple connected devices and provide the best speeds to each device. Slow internet speed and long page load times. Regular connectivity dropouts and buffering watching Netflix or YouTube etc. Intermittent problems connecting a device to the network or internet. Often, speed and connectivity problems experienced by the user are caused by a poor wireless solution, rather than the ISP connection speed. Upgrading to a faster connection (e.g. VDSL, Fibre) will not actually fix the problem. It’s like putting a Ferrari in a traffic jam – it can still only go as fast as the slowest car. A medium sized home usually requires two or three wireless access points to achieve good wireless coverage throughout the whole house. Where possible, iPower hard-wires each wireless access point back to the router to ensure each one has the best and most reliable internet connection. To provide a great wireless experience, the separate wireless access points must also work well together as a ‘managed WiFi system’. As your device moves around the house, your WiFi connection needs to move to the access point offering the strongest signal to avoid getting stuck in a weak spot. iPower only uses high quality WiFi equipment which provides a strong, reliable wireless internet connection throughout the whole house, even for homes with the most demanding teenagers and many connected devices. Our equipment uses the latest WiFi standard 802.11AC and runs on both 2.4GHz and 5Ghz so all devices can connect in the best possible way. Each access point is hard-wired back to the router to provide the most robust and highest quality WiFi network possible. A separate WiFi network can be setup for the Kids and times set so the WiFi network is not available at night time, so the kids really are sleeping! Configured to ensure the highest security is applied to your WiFi network. WiFi is separated away from the router, so changes of ISP or connection type (e.g. ADSL/VDSL/Fibre) will not affect the WiFi setup. Provision of a separate ‘Guest’ WiFi network. Devices on this network get internet access, but cannot see other devices in your home. Option of providing ‘outdoor’ access points to provide WiFi in the garden or outside area. How would you also like to control the time when wireless connectivity to the kids devices automatically stops? No more sneaking their device into the bedroom to carry on chatting or online gaming without your knowledge. Our equipment lets you do this as well. iPower have the knowledge and expertise to setup problem-free wireless networking in your home so you can focus on enjoying the internet instead of struggling with it. Contact iPower now to see how we can assist you with getting a trouble-free wireless network in your home.